Before she steals the worlds heart in Iron Man II, get caught in the wicked web of Marvels sexiest and deadliest super-spy! 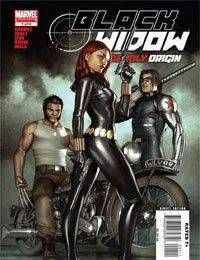 Shes been everything from a Russian espionage agent to a Champion to an Avenger, now a skeleton from Natalia Romanovas past is reaching out for those shes loved and lost...and the Black Widow has many victims to choose from! From the frozen streets of Moscow to the upper stratosphere, writer Paul Cornell (CAPTAIN BRITAIN &amp; MI3) and artists Tom Raney (DARK REIGN: HAWKEYE) and John Paul Leon (The Winter Men) deliver a globe-hopping, bone-breaking, high-tech thriller that reveals how Natalias shadowy past threatens all she now holds dear. Guest-starring the Winter Soldier andWolverine!